Jim Hansen has been in and out of rocketry for 50 years. First you see the signs, yellow with bold, black lettering: "Caution. Rocket launch in progress." They're posted at the far end of a black gravel driveway that leads past a farmhouse and scattered harvesting equipment, and right up to a red dirt road that opens to a clearing between two cornfields. A row of cars, like an honor guard standing at attention, is parked behind a line of white flags demarcating the safe zone. Down the field are 15 launch pads, grouped into sections denoted by letters from A to D, set up at varying distances. Rockets with engines less than an inch around will launch from the six A pads. Pads B and C are for rockets with larger engines. But today's crowd of about 12 is most interested in the two D pads 50 yards down. It's shortly after 11 a.m. on an overcast, but not rainy, Sunday in August, an ideal day for firing model rockets into the sky. Wind, at least what can be felt from the ground, is minimal. The cloud ceiling is very high, which makes Ken Derstine's 5-foot rocket, named This End Up, the perfect one to let loose. Inside the rocket's base, near the fins, is a reloadable metal casing, 6 inches long and packed with ammonium perchlorate, a rubbery, granular, solid rocket propellant. This is the type of stuff used in military-grade rockets, albeit in larger quantities and with other substances. At a nearby launch station, someone checks to make sure that the electric current running through the wires from the operator's table to the D pads is unbroken. When the current makes it to the D pads, it will transfer to an aluminum wire coated in a pyrogenic substance that will ignite the propellant. Countdown begins: 5, 4, 3, 2, 1. In less than a second, the rocket lifts from the pad at more than 200 miles an hour with a noise that sounds like a cross between a whoosh and a thawed steak hitting hot oil inside a frying pan. A swirl of fluorescent green and orange knifes through the sky with a smoky black trail chasing behind. Craned necks track its progress. After about nine seconds, the rocket burns through the last of its fuel and, at 1,040 feet, hits apogee, the moment when the forces of gravity begin to pull it back to the Earth's surface. A distant pop registers as the rocket breaks apart at the middle — all part of the plan. The first parachute, a thin piece of nylon called a drogue, deploys; its purpose is to prevent high-altitude winds from pulling the rocket into the remote reaches of either of the two cornfields boxing in its descent. A programmable altimeter powered by a 9-volt battery inside the rocket tracks its altitude as it falls, and at 500 feet, the nose cone breaks away. In a process known as dual-deploy, a second parachute flows from the top, slowing the rocket's descent even more until it recedes behind the stalks of corn on its way to a soft, and recoverable, landing. 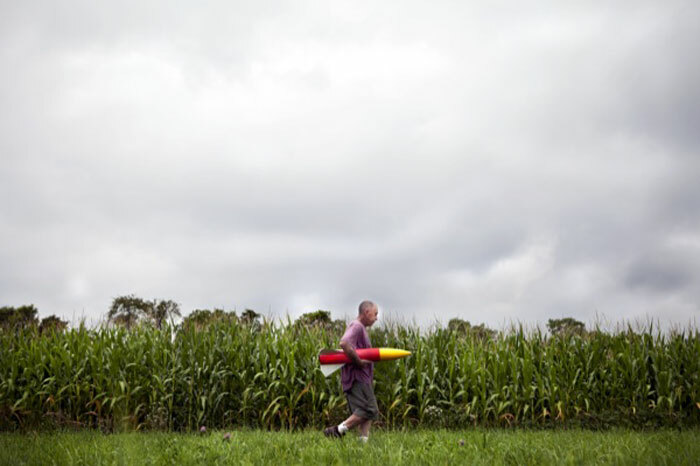 Barry McGarvey, a man with a shaved head wearing a yellow reflective vest — the person attending the launch station, and therefore responsible for pushing the buttons that send rockets skyward — gives the all-clear, and Derstine begins his walk through the damp, calf-high grass and into the cornfield to find his rocket. Another one down — another 50 to go. Welcome to launch day with the Philadelphia Area Rocketry Association (PARA). Like the faithful on pilgrimage, members of PARA have been returning to this Bucks County farm once a month since 1990. Located in Ottsville, about an hour north of Philadelphia, the field, which PARA rents from farmer Jim Hallowell, is a refuge to this band of rocketry geeks. Instead of dodging confrontational neighbors in parks near their homes or packing up their launch stands quickly when a baseball team shows up to reclaim the diamond, they get four hours the first Sunday of every month, save for any forces of nature that put a damper on a hobby that requires sparks, flames and dry black powder. Membership in the group, while never a major concern, has waned to just 16 this year. Now it's on McGarvey — a man who builds his own rockets and is certified to fire off ones boosted by engines as thick as Italian salami — to keep the tradition alive as PARA enters its 25th year. "We'll fly any month of the year, as long as conditions are OK," says McGarvey, 47, a Northeast Philadelphia resident and PARA member for the last five years. Discovering this local rocketry club took McGarvey some time, however. Growing up near Franklin Mills, he and his brother would shoot off model rockets behind their house. At age 21, McGarvey bought his first model rocket, and as his interest grew he resorted to finding any open, flat area to fire them, a strategy that often led him to unorthodox launch sites — considering he and his wife were living near Keystone Racetrack (what is now Parx Casino). "I'd go over to the parking lot and fly it," he says. "Didn't have anybody's permission to do it. I did that for a good 15 years before I found [PARA]. I didn't even know these types of things existed." Getting the word out about the group is part of McGarvey's challenge now. For the last two years he has served as president of PARA, a position he assumed when the last president wanted to step down. "I said this is a good thing; we can't just let it die," he says. PARA members are a tinkering subculture. They arrive at the Sunday launches with toolboxes and plastic crates of gear crammed into car trunks: pliers, wire strippers, screwdrivers, pencils, igniters. Some carry extra grease to make dysfunctional rocket parts easier to pry off. McGarvey brings a tub of nylon parachutes this August afternoon, as well as additional shock cords made of flame-retardant Nomex and Kevlar. One member carries an entire case of "dog bark," slang for a protective insulating material placed inside the hollow body of a rocket between the engine and the parachute. They fawn over rockets the same way car collectors go weak in the knees for '68 Mustangs. Grab any one of them, and they all say something similar: "I've been launching model rockets since I was a boy." Many of them today build their own rockets from cardboard and fiberglass tubes in basement and home workshops. The rockets range from barely a few inches to more than 6 feet tall. The size and location of the PARA launch field limit what rockets can be launched, restrictions imposed by the Federal Aviation Administration. "You can't fly these in the neighborhood," says Derstine with a laugh as he prepares Red Dawn, a 71-inch-tall, high-powered rocket wrapped in fiberglass for extra strength. The fins are three-ply wood, tougher than balsa. A 59-year-old mechanic from Sellersville,Derstine has been with the group for about eight years, and has the losses to show for it. "I've got a couple hanging out in the woods back there, across the creek," he says, his index finger pointing to the far edge of the launch field, where the rows of corn trail off into a grove of trees. "As you come here, you learn. You make a mistake. You go too high. A lot of times, it's not windy here, but you get up too high — I got a couple hanging over there." Chasing falling rockets is part of the PARA ritual. Even though prepackaged model rocket kits start at only $10, prices increase from there to $100 for larger rockets with bigger engines. One of Derstine's rockets hanging in the woods still holds a reloadable metal casing worth $70. And no member wants to lose a built-from-scratch rocket, for which he might have made measurements, cut fins and tubing and sourced sturdier wood and fiberglass. This End Up took Derstine several weekends to assemble, he says. Though a certain amount of unpredictability hangs over the monthly launches — PARA members, in addition to paying $25 in annual dues and a launch-day fee of $5, must sign a liability waiver acknowledging that "known risks of participating in rocket launches include ... bodily injury and death" — there's a greater chance of damage to a haphazardly constructed rocket. Chris LaBelle, a landscaper and part-time chemistry professor who brings his 13-year-old son, William, to the launches, sees his 8-inch rocket explode into three parts not long after it clears the launch pad. "Keep an eye on section three!" he calls out, hoping for help in finding it. John McConville, a 28-year-old mechanical engineer from Allentown who has been attending PARA launches for the last year and a half, experienced a different problem with his foot-long orange rocket dubbed Wizard. Takeoff was a cinch, and the Wizard reached apogee at the height of its flight as it was meant to. But as the nose cone on McConville's rocket popped off to release the parachute, it detached from the rocket body along with the parachute. "Separation!" everyone cheers — followed by a wisecrack about separation anxiety — and McConville takes off running toward the cornfield with eyes trained skyward. Without the help of a brightly colored chute, it's difficult to place a falling rocket, but a thud is audible from about 30 feet away, and McConville returns from navigating the maze of corn with Wizard in hand. The Philadelphia rocketry group is one of 125 similar groups scattered across the U.S. and affiliated with the National Association of Rocketry (NAR). The founders of PARA, none of whom are still group members today, were all local members of the NAR. As a nonprofit scientific organization, the NAR promotes both the hobby of sport rocketry (as model rocketry is known to enthusiasts) and youth education to swell the ranks of its 5,800 members nationwide. It's also the NAR that bestows certifications on adult rocketry hobbyists like McGarvey and Derstine. Perhaps it's no surprise that a group that has been so influential to the growth of model rocketry in the U.S. formed in 1957. That was the year the Soviet Union launched the first satellite into orbit, the opening shot in a space race that would see the founding of the Gemini and Apollo space programs as well as an American president who told the country, "We choose to go to the moon." It was the U.S. that took both the small steps and the giant leap into space travel and exploration. Rocketry, it might be argued, is as American as baseball and apple pie. But sustaining interest appears to be a game of hit-or-miss. "People seem to come and go out of rocketry," says McGarvey. "There's a core group of us that's seemed to stay the same. For some reason I guess people move on or their life becomes too busy." Like McGarvey, Derstine first began launching rockets as a kid. But as he got older, and had his own children, he drifted from hobby rocketry. It wasn't until his three sons graduated from college that he found time to take up model rocketry again. Jim Hansen, a retired electrical engineer easily recognizable by the stud in his left earlobe, tells a similar story. "I started when there were no rocket kits. I had one book on rockets and was using powdered zinc and sulfur for fuel. I made my first gunpowder when I was in the sixth grade," he says proudly, a toothy grin forming under his trim gray mustache. He's been "off and on" in model rocketry for more than 50 years, he says, taking what seems to be the requisite break after getting married. For the last eight years, though, Hansen has been a steady presence in PARA, as both a past president and an active participant at the monthly launches. (He's the one who brought the case of dog bark.) At 71, Hansen's the elder statesman of the group. The biggest rocket he'll set off on this day is Minnie Magg, a 4.8-pound rocket that flies off the D pad. "I was born on the Fourth of July. And that's 90 percent of the battle right there," he says. "I always enjoyed the fireworks, and rockets were just a natural progression." Occasionally PARA will attempt to attract newer, and younger, members. On Oct. 5, nine cadets from the Northeast Philadelphia Composite Squadron 104 of the Civil Air Patrol will head to Ottsville to launch rockets that McGarvey helped them assemble. While construction of the rockets is a worthwhile challenge, the real joy surfaces on launch day. When Big Bertha, a 2-foot, all-black rocket, comes off the launch pad and goes screaming 1,500 feet into the air, McGarvey quickly dons his sport shades, stretches his neck upward and then shouts, "I got it!" before tearing off running down the dirt road, parallel to the cornfield, so he can pinpoint the exact spot where it lands. And in that moment — seeing a grown man break into a big smile before galloping after a rocket falling under chute — I'm reminded that my own path to this story mirrored the stories I've been asking strangers to tell me all afternoon. I was an 8-year-old boy growing up in Chester County when my father bought my first model rocket. It was a kit that included several small engines sold by Estes, one of the more popular model rocket manufacturers. We assembled it together; it couldn't have been taller than a foot. He showed me where the fins attached to the rocket's base and at precisely what angle I should hold the bottle of Super Glue to make sure the nozzle wouldn't clog. An aerospace engineer by training, he explained to me the purpose of the pinkish-red streamer we stuffed into the rocket body before pressing on the nose cone. On weekends he would drive us to Hibernia Park to launch it, making sure that I never got too close to the lit engine. I'd gawk at the sky waving my index finger around, never quite sure exactly where my rocket had flown. When the streamer shot out of the nose cone I'd run at him to get his attention, and then he'd tell me to run after it. One day, we lost it in the trees, and I cried the entire way home. I loved that rocket, but I loved those afternoons with my dad even more. As the hours ticked away that recent August Sunday, I thought more than once about searching for a local hobby store, buying my own rocket and chipping in my $5 at the next month's launch. I was envious. Here was a menagerie of proud geeks joining in on an activity that's overwhelmingly nostalgic — for all of us. "You come out here and you just spend a day launching rockets. You're not bothering anybody. Nobody bothers you. You don't have to worry about anything," says McGarvey, almost breathlessly. "When that smell of the burnt rocket fuel mixes with the manure, I enjoy it, as weird as that sounds. I just love this stuff."